Beginning at 8:30 a.m. EDT, NASA Television will provide live coverage of the docking of a Russian Progress spacecraft carrying nearly three tons of food, fuel and supplies for the Expedition 41 crew aboard the International Space Station. Docking of ISS Progress 57 to the Pirs Docking Compartment of the space station is scheduled for 9:09 a.m. Launch of ISS Progress 57 from the Baikonur Cosmodrome in Kazakhstan occurred at 3:09 a.m. (1:09 p.m. local time in Baikonur) this morning. The spacecraft will remain docked to the station for six months. 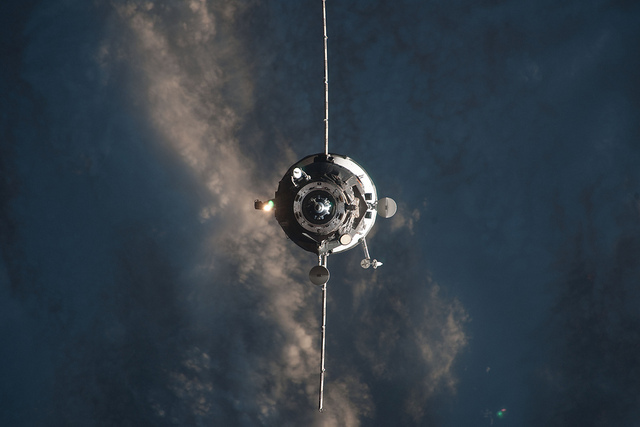 An ISS Progress resupply vehicle approaches the International Space Station in January 2012. I love Nasa TV. The images of space are incredible. My kids watch as well.